Attorney Lee Merritt is calling out San Bernardino District Attorney Michael Ramos for prosecutorial misconduct. New developments in the case are calling for the prosecutor to be fired due to blatant obstruction of justice. On April 5th, Yarber, his cousin and two friends were cornered by four Barstow police officers after Yarber pulled into a parking space at a local Walmart at 10 a.m. According to reports, Officers Jimmy Alfred Walker, Jose Barrientos, Vincent Carillo, and Matthew Allen Helms, confronted Yarber in response to an alleged call about a “suspicious vehicle.” The officers, who believed Yarber matched a suspect in a stolen vehicle case, were in the process of conducting a traffic stop. According to witness statements, Walker, Barrientos, Carillo, and Helms were yelling racial slurs the entire time of the stop. When Yarber attempted to leave, the officers shot over two dozen rounds into his car—10 of which hit Yarber. Two other passengers in the car were severely injured, but Yarber was pronounced dead on the scene. He was unarmed. Interestingly enough, video footage shows the car was moving without any officers or officer’s patrol cars in its path. Moreover, the San Bernardino Sentinel reports that Officer Walker has a history of racial abuse and misconduct. In 2010, he was fired for calling a Black couple, “stupid f**king n**gers” during their arrest. He was charged with a hate crime by the San Bernardino District Attorney’s Office, but was later reinstated and put back on patrol. Despite the lethal excessive force inflicted by the four police officers, Walker’s alleged racist past and officer training that prohibits shooting at moving vehicles, San Bernardino District Attorney Michael Ramos has publicly stated that he will not prosecute the officers, claiming they were justified in their actions. Fact is, this isn’t Ramos’s call to make. As district attorney, his responsibility is to take the evidence of the case to a grand jury, who will then determine if it’s enough to pursue charges against the officers. Ramos has deemed the charges against these men as “unwarranted” prior to performing a thorough investigation. S. Lee Merritt, the attorney representing the Yarber family, says Ramos’ actions are an acute representation of prosecutorial misconduct. Merritt is calling for Ramos to recuse himself from the case and is also requesting Xavier Becerra, California’s attorney general, to investigate, evaluate and prosecute Ramos for his actions. Moreover, Merritt claims that Ramos’ lack of interest and involvement is due to political alliances and allegiances. “Advocates of law enforcement previously approached the district attorney and said they didn’t believe he would give the officers a fair shake because Mr. Ramos had previously prosecuted at least one of the officers, Jimmie Walker, for hate crime charges,” Merritt told theGrio in an exclusive interview. As Merritt continues to bring attention to this case, Diante Yarber’s family struggles to make sense of a life suddenly without him. It’s a feeling experienced by too many Black families who have lost a loved one by the lethal hands of law enforcement. Police brutality is symptomatic of systematic racism and prejudice in the United States and things don’t appear to be getting better any time soon. 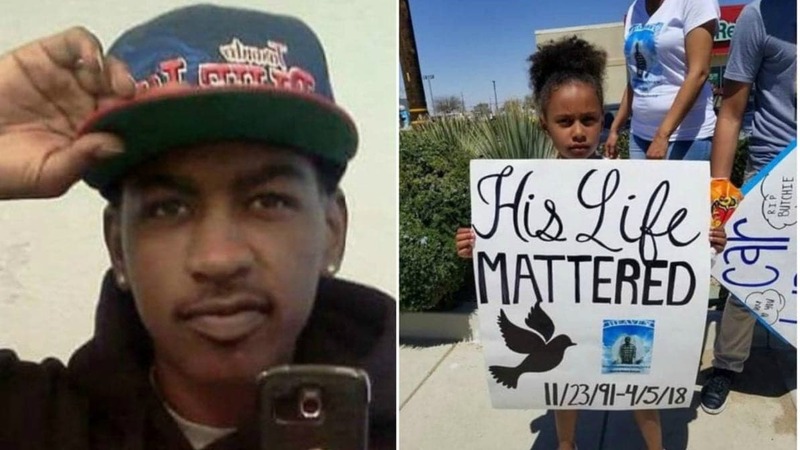 Despite a slew of local support the Yarber family receives in San Bernardino, Ramos’s statement only adds to further their devastation, leading them to wonder, will they ever get justice for Diante? Jaimee A. Swift is a Ph.D. candidate at Howard University with a focus in Black Politics in the African Diaspora. You can follow her on Twitter at @JaimeeSwift.